avaricious and prodigal on earth. 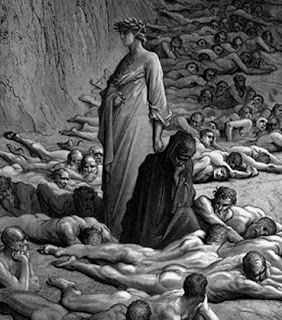 "Purgatorio: Australia Today" is one event being held in conjunction with the Melbourne Writers Festival that's really unusual. Not just because it's readings, rather than panels, so it's actual literature, not talking-about-literature, for a change. But it's being held away from the usual Fed Square venues in St Michael's on Collins Street, for the purposes of appropriate churchiness in which to celebrate Dante's epic. Look at the array of authors on offer at this event. What will they bring us? I can only tell you that my contributions is about competitive stairclimbing and supermodels—the others will be as new to me as they are to you. To find out more ahead of time, you can go over to Radio National, where Books and Arts Daily today talked to Ellen Koshland, the organiser of this wonderful event, and Maria Tumarkin and Sam Wagan Watson, two of the other contributors. Here is my list of events at the Melbourne Writers Festival in the next week, starting on Friday with a thoroughly overstimulating day at the "final chapter" of the Edinburgh World Writers' Conference, which I saw kicked off in actual Edinburgh. Last year I hung back terrified of all the brilliant brains around me, but this year I am being forced to participate by going on the "Style vs Content" panel with the (OMG, brilliant) Kirsty Gunn, whose novel The Big Music I have been clambering through awestruck for the last week or so. Francesca Rendle-Short will be wrangling us. There are also sessions on Censorship, the Future of the Novel, Junot Diaz on whether literature can effect political change and a session on "A Post-National Literature". There'll be a lot to chew on. 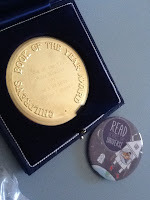 I was very honoured to receive this medal from the Children's Book Council of Australia for Sea Hearts, in Canberra on Friday, at a well-attended ceremony including several classes of schoolchildren. A complete list of winners and honour books is over here.